My conference in California last week was ALL kinds of fun! We were at the Google campus and learned so much about blogging and also had such a great time catching up with friends and meeting new ones. So… it’s March now. And in my life, growing up in the South, that’s always meant March Madness. 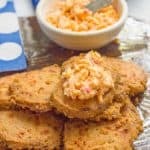 Some favorites include my cold chili cheese dip, which takes just minutes to put together and is great with chips and veggies, and my healthy slow cooker buffalo chicken, which I love serving up as sliders. They go so fast! 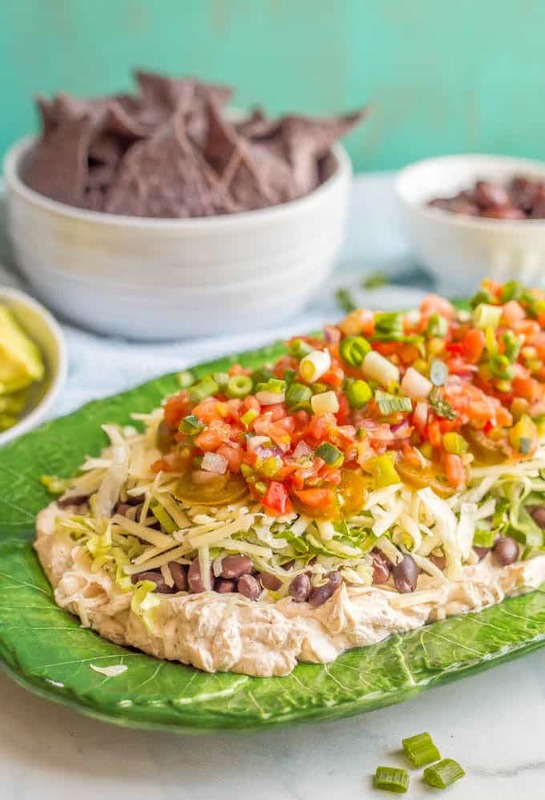 This year though I’m planning to serve up this quick + easy healthy 7-layer Mexican dip! I also love that it’s super versatile and can be customized to include your favorites. 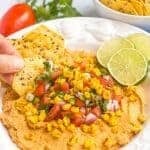 You can change up the type of cheese or beans you use, add your favorite style of salsa and I’ve left the 7th layer up to you. I use non-fat Greek yogurt but you can substitute sour cream if you prefer. It’s not as thick as Greek yogurt so you may not need as much to help thin out the cream cheese. Start with 1/2 cup and add from there. 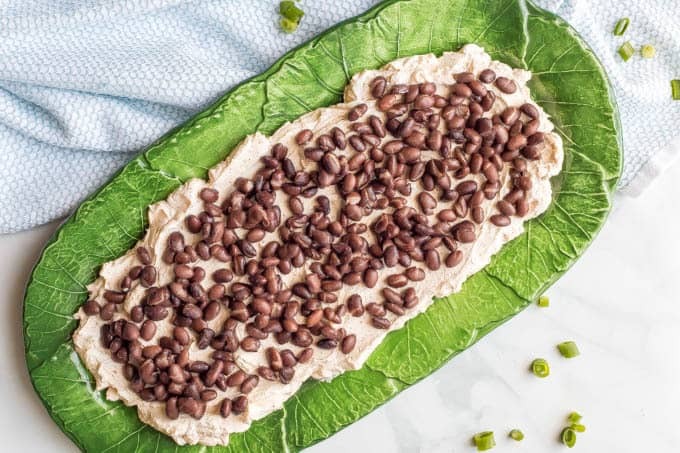 I don’t use the entire can of black beans for this recipe, probably about 3/4 of it. Use as much as you like or substitute another kind of canned beans. 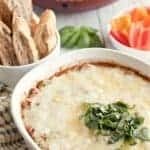 Iceberg lettuce gives the best crunch for this cream cheese dip, but you could use part romaine if you’d like – the color mix would be pretty! If you don’t want to use the pickled jalapeños, you can substitute pickled red onions or just leave them off. 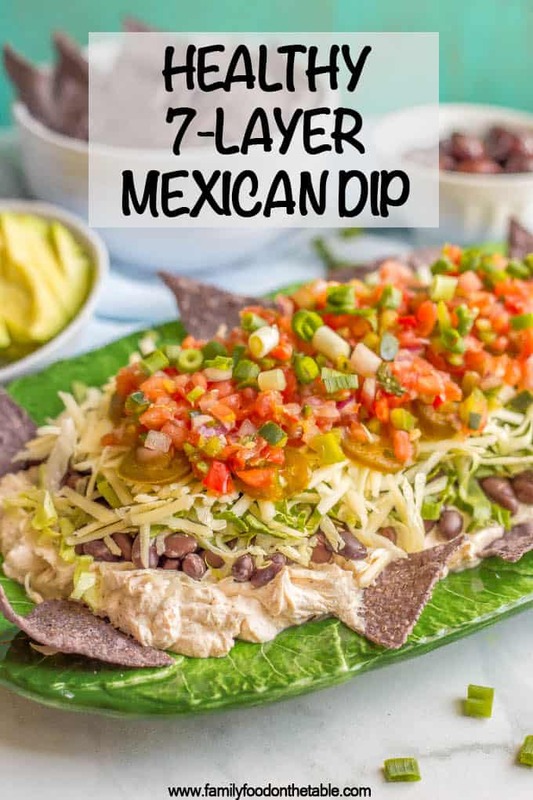 You can use any of the extra topping ideas to make a full 7 layers. I use homemade taco seasoning but you can substitute store-bought. 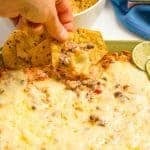 This is a vegetarian cream cheese dip as is, but you could certainly add ground turkey or beef as one of the layers (either as a substitute for the black beans or above or below them in the layers). 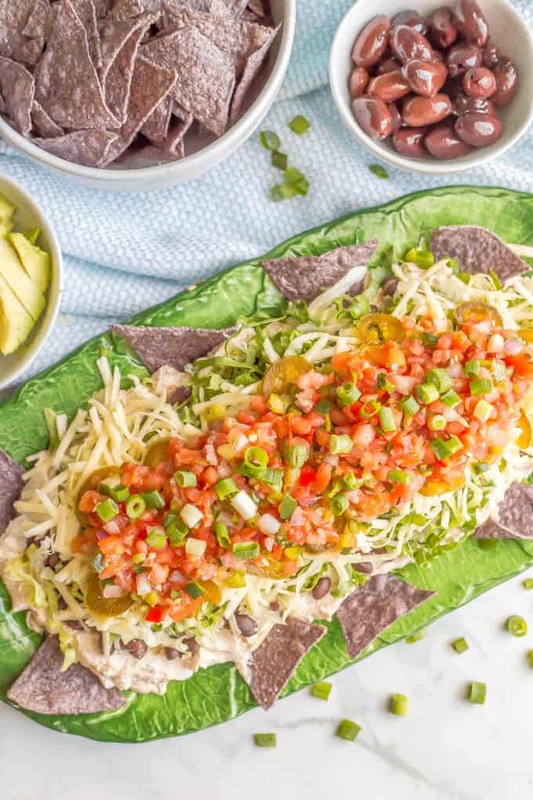 Oh, and for the optional seventh layer, guacamole or diced avocado is perfect if you’re an avocado lover, but halved olives also are super tasty. 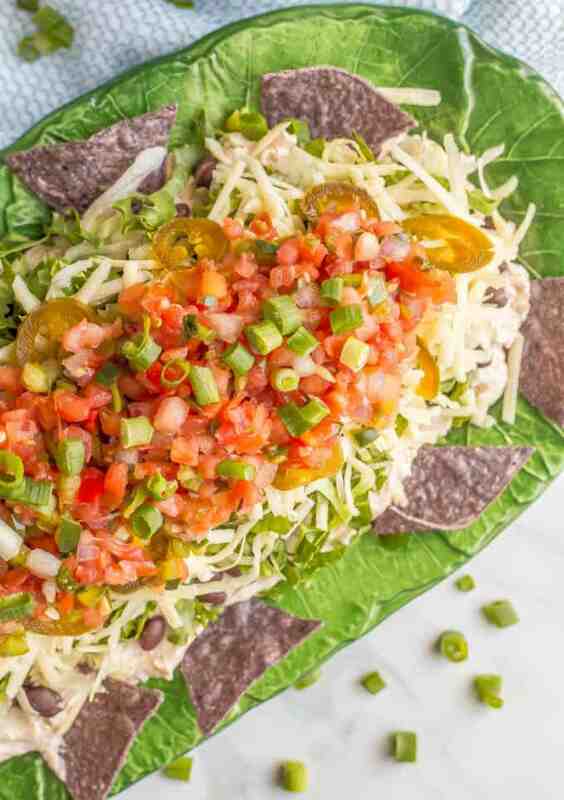 You can even go low-key and use some chopped fresh cilantro or sliced green onions as your seventh layer. Whatever you have on hand! So as always, feel free to customize this and really make it your own with your favorite ingredients. 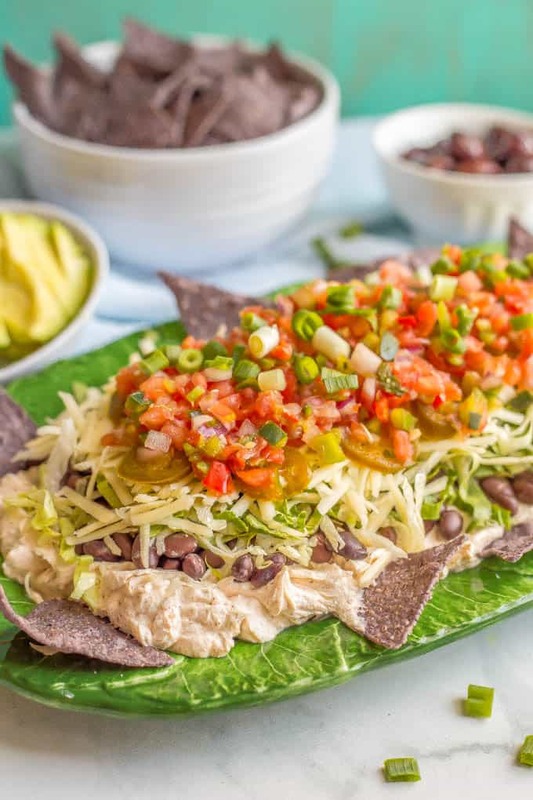 Any which way, you are going to love the rich, cream cheese base and the bright, fresh veggies in this 7-layer taco dip. It’s got SO much flavor and it’s a beautiful dish to put out as well! 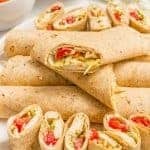 Everyone loves digging into this and you are going to be getting lots of compliments – and requests for the recipe! P.S. Serving this in a gorgeous dish is a great way to show off your layers. Check out these pretty glass serving dishes. 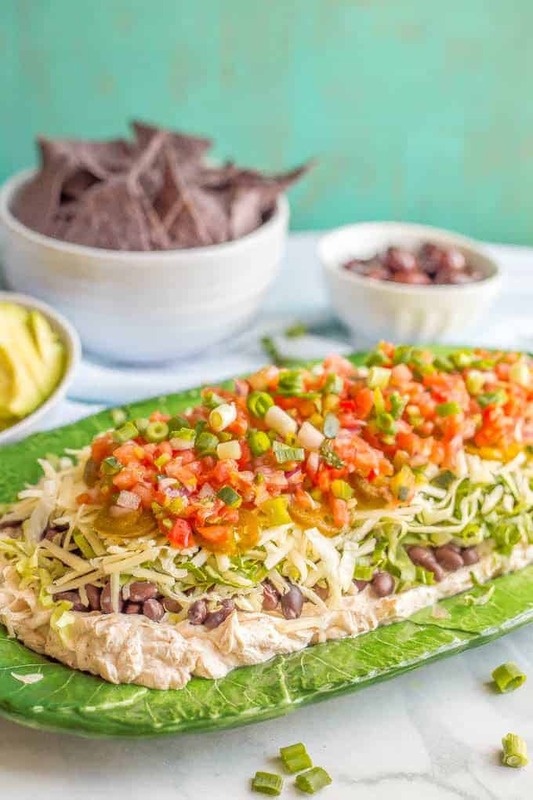 This easy, healthy 7-layer Mexican dip is creamy and cheesy and perfect for parties! In a small bowl, mix together the cream cheese, Greek yogurt and taco seasoning until smooth. Place cream cheese mixture in an even layer in your serving bowl or plate. 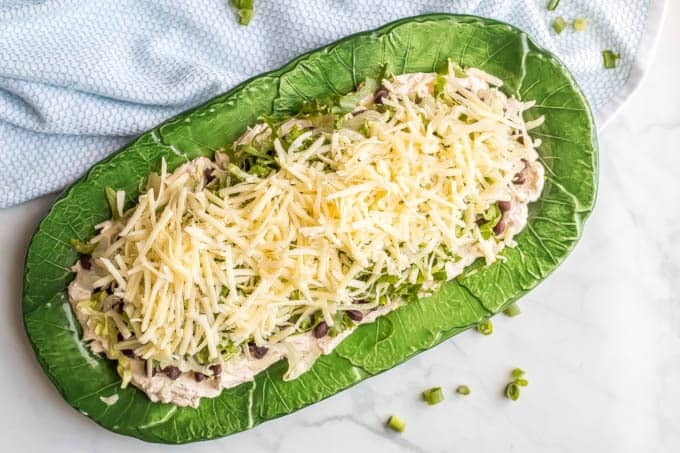 Top cream cheese with black beans, shredded lettuce, shredded cheese, jalapeños and salsa. 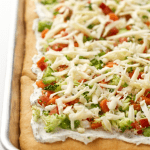 Use your 7th layer topping of choice and serve immediately or refrigerate until ready to serve. 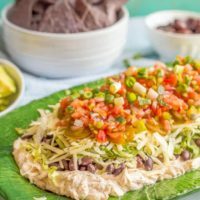 Iceberg lettuce gives the best crunch for this cream cheese dip, but you could use part romaine if you’d like - the color mix would be pretty! Such a fun party dip! Always a hit with everyone! So much flavor but a lot of great choices to keep the calories in check! thanks so much! It always goes over so well at parties!